The flood protection industry is growing rapidly and is being pushed forward by both national policy and market forces. However, the danger of this fast pace of growth is that it is ploughing ahead without the empirical evidence needed to base design of defences on. Expert knowledge based on experience in other fields such as basement water proofing and historical repairs is invaluable but needs to be drawn together in a strategic and comprehensive way. 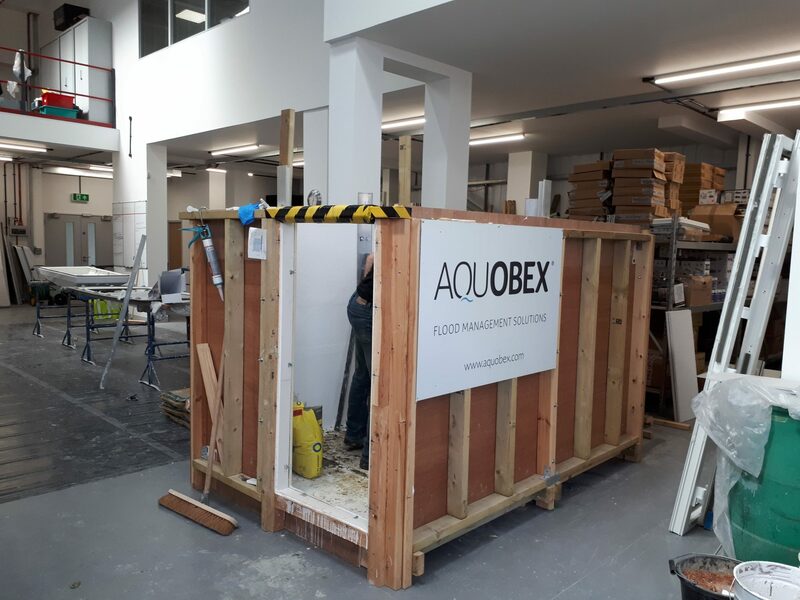 As a Knowledge Transfer Partnership associate at Oxford Brookes University I have been working with Aquobex to develop testing protocols for assessing the performance of different approaches to flood resilience. This two year project started in January 2017 and has been a huge success in harnessing the expert knowledge of buildings at the School of Architecture at Brookes, building on their many years of experience of testing for industry. The plan for the project was to start off by testing materials individually to understand their properties, moving on to testing materials in combination and building up our knowledge to eventually test details which involve the real difficulties of flood protection of buildings, the junctions of different elements of a construction. These stages were originally planned to be done in series but an opportunity arose that could not be missed. 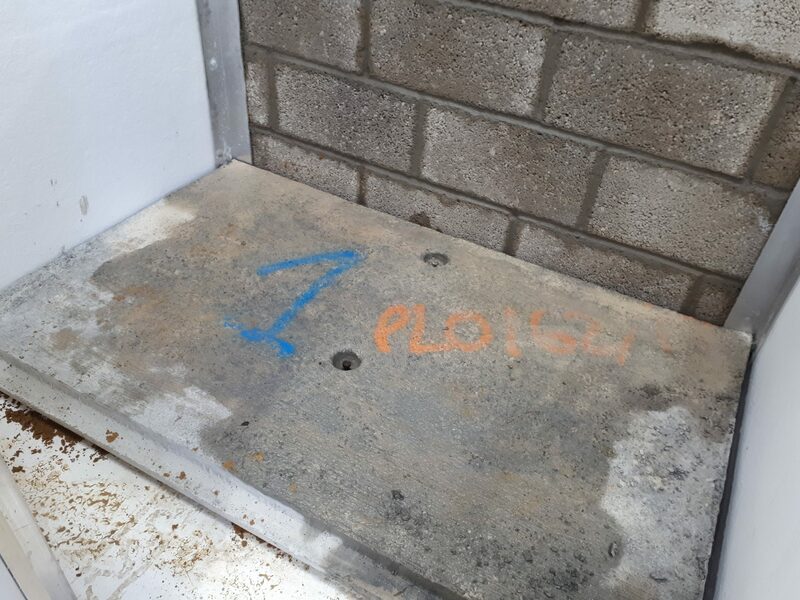 A project emerged that offered us the opportunity to be involved in the installation of a range of flood protection in a property in Carlisle which formed part of a project funded by the Prince’s Trust as a means of promoting property-level flood resilience, run by Mary Dhonau. We were excited to be involved in this project, partnering with others in the industry, but we wanted to ensure that any measures installed were tried and tested before being installed. This also offered us a chance to apply our testing methodologies to the detail level. It was a little ahead of schedule within the project but it offered us a chance to really understand what we need to know from our material-level testing. 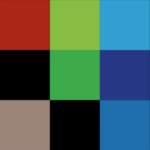 It quickly became clear that in fact, the change in project planning was for the better, so we set about planning the tests. The house was originally a barn with a stonework wall and was converted by building a block-work inner leaf and insulated internally. When it was flooded in 2015, the water reached a level of 1 metre and the internal finishes were removed up to that level. Our challenge was to stop water from coming into the house and to ensure that if water did get in, damage to the internal finishes would be minimised. Guidance states that external walls should only be made water resistant up to a certain height, as water can exert incredibly large amounts of pressure on a wall that can lead to structural failure and this property has flood guards on the door that protect it to 900mm so this is taken as the maximum to which we can make the walls impermeable. 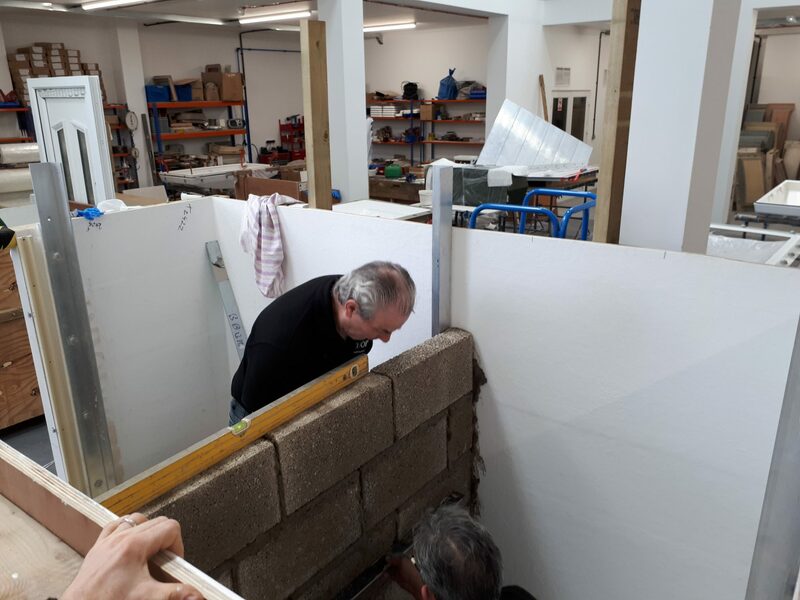 We wanted to replicate the situation on site in the house in Carlisle as much as possible so in our test tank we built a stonework wall and a concrete floor slab to replicate the structure. We are assuming the worst case scenario of the stonework external leaf being breached and a full head of water acting against the blockwork inner leaf of the wall. 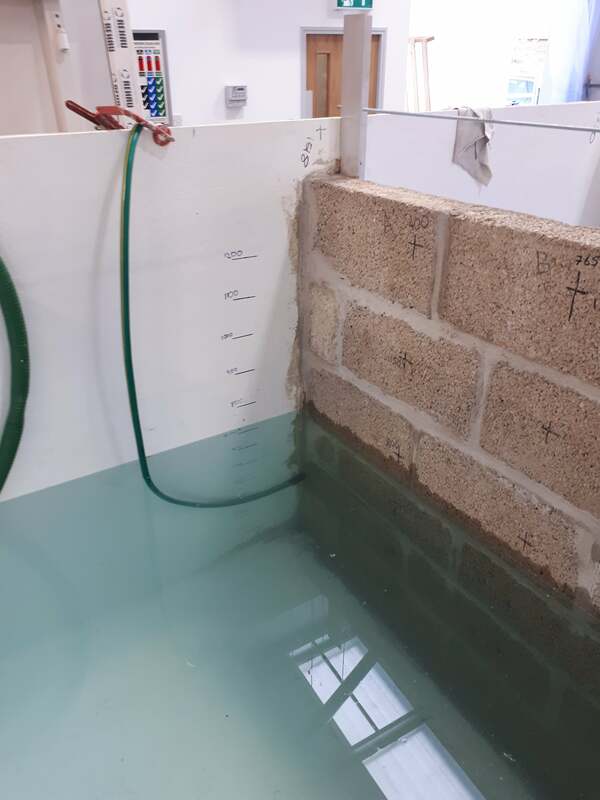 Our first tests tested an approach of keeping water out of the property with a cement based render up to 900mm and then allowing water into the property. 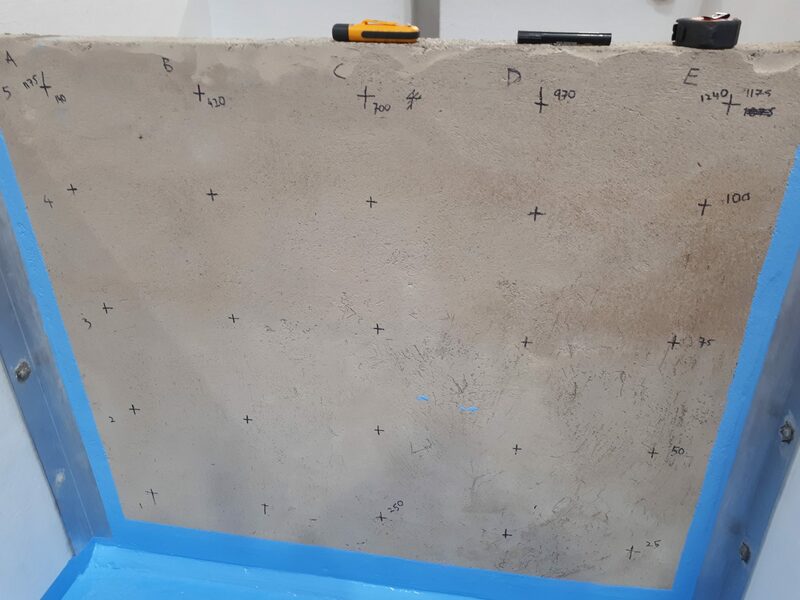 In order to minimise damage to the insulation and keep water away from the internal face of the render, we designed a system using a closed-cell insulation, metal stud and water-resistant board. Before the tests we took moisture measurements of all of the different elements including the blockwork, the render, the board, the insulation and the floor. In order to detect entry of water into the cavity between the render and the insulation we used water sensors with alarms at different heights. We invited people from the companies that provided the products being used in the tests to witness the procedure as means of being transparent in our methods. On Tuesday 17th October we gathered a small group and we flooded the test tank up to 900mm. We observed as the water reached its full height and waited to see how our system would perform, taking measurements and photos that will go into our test report to be released shortly. The results of our tests were very informative. We learned quite quickly that our system needs to be refined. We are not yet completely satisfied that the approach selected was the right one to be installed in the house of someone that has been out of home for nearly 2 years because of flooding previously. We want to ensure that whatever we specify offers the correct level of protection for the homeowner to feel comfortable and safe. These tests and the results we garnered from them prove the value of testing any proposed solution. The next step now is to refine our approach and carry out another set of tests that will lead to the best possible solution for this particular case. 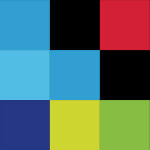 We are excited and determined to use cutting edge research to offer cutting edge solutions. To learn more about the testing itself and hear what our experts had to say about flood resilient solutions, follow this link.